Are you the 2014 Range Rover Sport? Design-wise, the new Sport appears to borrow heavily from the smaller Evoque crossover while still having plenty of cues that tie it to the all-new Big Daddy Range Rover. 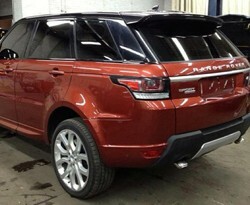 The two-tier grille mimics the three-tier one of the larger Range Rover, and the headlamp and taillamp clusters follow similar design cues (though the rear lights are more squared off than vertical), but parts of the front fascia are clearly reminiscent of the pretty little Evoque, as are the rocker panel flares that remind of the three-door model. 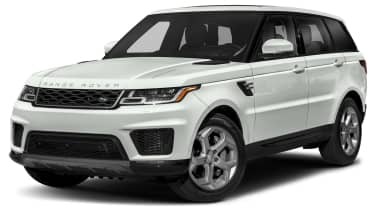 Unlike its costlier Range Rover sibling, there are no vertical faux side vents embossed in the door skins – instead, there's a small fender vent above the front wheels with a pair of matte silver strakes to give directional thrust. Tip: Hat tip to Dan!